"What would that family want to read about television?" The BBC had been publishing Radio Times magazine since 28 September 1923 in response to a boycot of broadcast listings by the newspapers of that period, following the BBC's refusal to give in to demands by the National Publishers Association to pay 'a hefty-fee' to publish its radio broadcast schedule. Although that relationship had changed after the war when radio and later television became more popular, before the 1990 Broadcasting Act both the BBC and ITV retained exclusive rights over their own weekly television listings. Newspapers were permitted to carry programme schedules only for the day of their publication but other magazines, published as weekly periodicals, were excluded from doing so. Indeed other magazine publishers in the early days of television broadcasting would almost certainly have deemed it not worth their time in publishing the BBC schedule when, before and for some time after the war, so few people owned television sets. But all that changed in 1953. In June of that year the BBC were given permission to enter Westminster Abbey and broadcast, for the first time anywhere in the world, the coronation of a queen. And so it was that on 2 June 1953 for the coronation of Elizabeth ll, television really came into its own. When it was announced that this historic occasion was to be televised the weeks leading up to the coronation saw the sales of televisions rocket, with an estimated 20 million TV viewers tuning in on the day to watch the young Queen crowned. If television had been regarded up to then as nothing more than a gimmick or a luxury of a select few, then that perception was blown away in June. With this new medium sweeping the country there would obviously be an interest from the public for information akin to those published in popular and long established magazines, which focused on entertainment and sport. Magazines that offered glimpses of what television was offering, life behind the scenes and the stars of the small screen. Publications such as Photoplay, first published in 1911, Picture Play (1915), Movie Mirror (1930) and Movieland (1942) had long been successful. 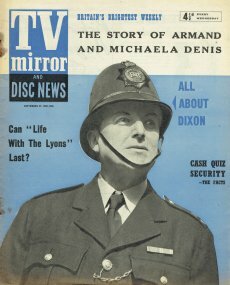 As television became popular so similar magazines would spring up and, although they were unable to publish programming broadcast details in full, they could focus on the these types of articles. 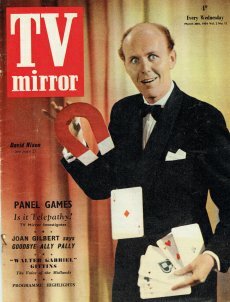 The first of these was TV Mirror, which hit the newstands for the first time on 29 August 1953 with Terry-Thomas on the cover smoking from a 'TV aerial cigarette holder'. Not affiliated in any way with Radio Times, TV Mirror was published by Amalgamated Press Ltd. The company was founded by journalist Alfred Harmsworth in 1901 and was by this time a long established producer of newspapers and magazines. Harmsworth began publishing the London based The Evening News in 1894 followed by Daily Mail in 1896 and also initiated The Daily Mirror in 1903. In 1908 he also acquired The Sunday Times. By that time he owned the largest periodical publishing company in the world. From 1912 Amalgamated Press were based at Fleetway House in Farringdon Street, London, E.C.4 and would keep on publishing independently until they were acquired by the Mirror Group in 1959 and renamed Fleetway Publications. The first requirement of any new publication is a clear idea of what the contents are to be, and these cannot be defined until there is a positive answer to the question: Who will read the paper? At our Editorial conferences no one figure emerged as a typical potential reader. It was the background of our readership which was sharply in focus-the background of the home. A living room with a television receiver, sometimes with a lone viewer-the housewife-and at other times the whole family, enjoying the fruits of an invention which we believe to be the country's greatest contribution to family life. What would that family want to read about television? Certainly not its deeper technicalities, far beyond the comprehension of the average person. They would want news of current and forthcoming programmes; articles and picture features about the people appearing in them. Our readers would want to know something of those who bring the programmes to the screen, and of the workings of the studios. A typical TV Mirror article. In contrast to the Radio Times, TV Mirror, with its colour picture cover and in-depth articles on the making of television, and its interviews with the stars and programme makers of the day, was a far more interesting read. 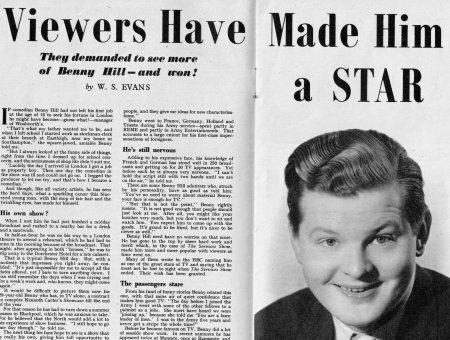 Whereas Radio Times was mainly (and quite rightly) a listings magazine that was broadcast information heavy and article light, TV Mirror more than successfully filled the gap with articles of interest to the avid TV fan. 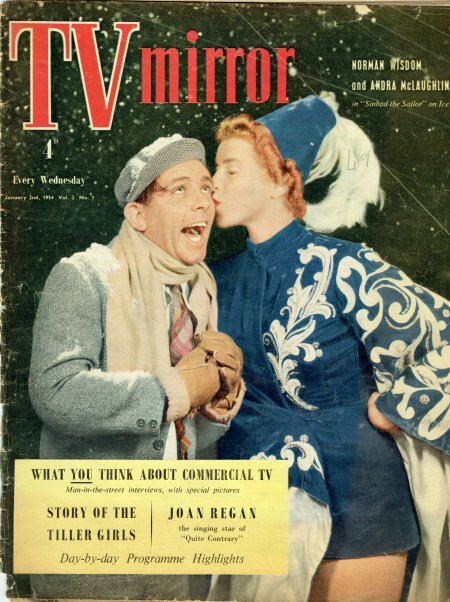 It was almost certainly an influence when Commercial Television was planning its own magazine, TV Times, which took the same approach to informative articles when it began publishing in September 1955. If TV Mirror had been able to publish TV listings it may have survived much longer. But by 1957 its readership began to decline. 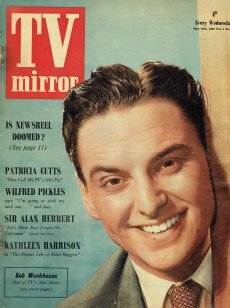 In April TV Mirror became TV Mirror and Disc News, incorporating reviews of the latest releases and articles on the pop stars of the day. Later still, in order to keep costs down, the colour cover went and eventually the name was changed to Picture Show and TV Mirror with the main concentration being on movies, until it stopped publishing altogether in 1960. 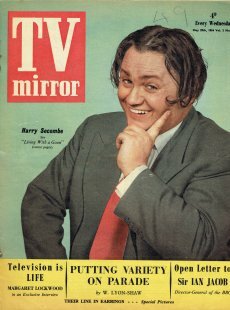 You can still find editions of TV Mirror, TV Mirror and Disc News and Picture Show and TV Mirror on eBay and other bidding sites. They will cost you anywhere between £2.50 and £10.00. A bit of an increase on its original 4d cover price, but a reasonable price to pay for the quality and wealth of its content.